Happy Sunday, friends! Sundays are a day to give thanks for everything you have: family, friends, good health, a roof over your head, love and…food. This week I have uncovered the true meaning behind being thankful for food, and since this is a food blog, I will spare you the details. But, if the word gastroenteritis doesn’t speak for itself then might I add in the fact that I am currently eating the millionth bowl of rice chex that I have had for breakfast since last Sunday due to the fact that my current BRAT diet consists of bananas, rice, applesauce and toast. Can you say YUM?!?!? Mmm, my tastebuds are just salivating with never ending love for these four foods of which I can 100% guarantee I will never touch ever again once this sickness is over. Poach 2 eggs in an egg poacher for 4 minutes. Meanwhile, in a small pan cook tomato, spinach, and pepper on low heat. In a small microwavable bowl, mix together all ingredients for the hollandaise sauce. Then warm in the microwave for 30 seconds. Remove, stir, and place back in the microwave for another 30 seconds. Toast a piece of bread, cut in half, and lay on plate. 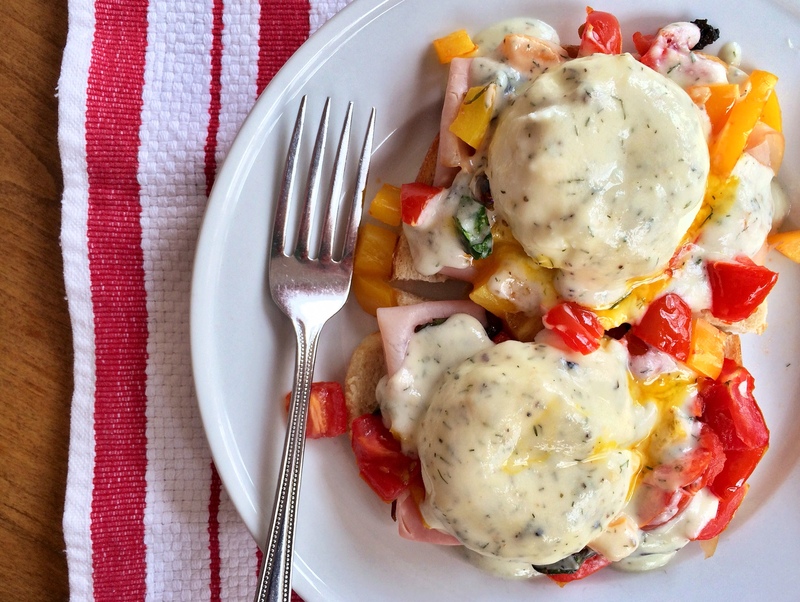 To assemble eggs benedict, top toast with 2 slices of ham, veggie medley, and then top with poached eggs. Finally, drizzle hollandaise sauce on top. Bon appétit! Previous Post It’s as easy as 1-2-1-2-3-4!